First Nerve: What’s in a Name? This photo of a road sign was taken by FirstNerve reader MT while bicycling through the hinterlands of Illinois this summer. 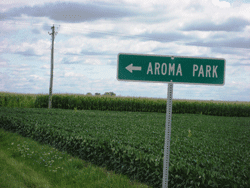 And yes, Aroma Park actually exists: it’s a village of 821 souls on the banks of the Kankakee River. Hah! Child’s play, my dear sir. Founded in 1852 by Alvin and Slocum Wilber, who created the word Aroma by playing on the name of their friend and associate James L. Romer. Reportedly, possible confusion between Aroma and Aurora led to changing the name to Waldron in 1872. It was changed back to Aroma, and the word Park was added about 1915. Too bad there isn’t an olfactory tale behind this delightfully named town. I grew up near Aroma Park but never knew the history behind the name. Too funny. So inquiring minds want to know: what did Aroma Park and its surroundings smell like? Anything from the mundane to the extraordinary . . . In the summer, there's the sweet, cloying scent of corn pollen mixed with black dirt, freshly cut grass, and warm, stagnant water when the Kankakee is low. All year, it smells of car exhaust, both gas and diesel, plus greasy food from the local restaurant. Depending on the direction of the wind, it used to smell of pig manure, but not anymore (low pork prices drove the small farmers out of business in the late 1990's). Thanks for the report--I can close my eyes, inhale, and be there! Man, I love the internet. Guy sends me a picture of a quirky road sign from a county road in the heartland and within hours I've pinned down a history of the town's name and discovered a former nearby resident who provides a precise, almost poetic, description of Aroma Park's aroma. What does corn pollen smell like?